Made with textured, merino-blend knit for that super-soft handmade feel, the Diamond Line Beanie is a fully lined lid for the utmost in winter warmth. The ultra-comfy blend of merino wool and acrylic is breathable, odor-resistant and won’t pill, and the interior lining is made of 100% merino wool jersey for added insulation and unparalleled next-to-skin softness. Diamond Line Beanie is rated 4.8 out of 5 by 9. Rated 5 out of 5 by bjh1958 from Soft and snug I just love this hat. I have several Icebreaker products so naturally I decided to purchase an Icebreaker hat when I needed to change. I'm really happy. Not too thick, stays put on my head but not clingy. Very warm and blocks the wind. Rated 5 out of 5 by Nanuk from Soft and Comfy Beanie This soft beanie fits snug on my head, very comfortable. The knit is refined and I especially love the inner lining - keeps my head and ears fairly warm in the wind. Rated 5 out of 5 by Halifaxwinter from Great gift I bought this for my wife. She loves it and I know it will be warm and long lasting. The whole family is now outfitted with icebreaker hats. 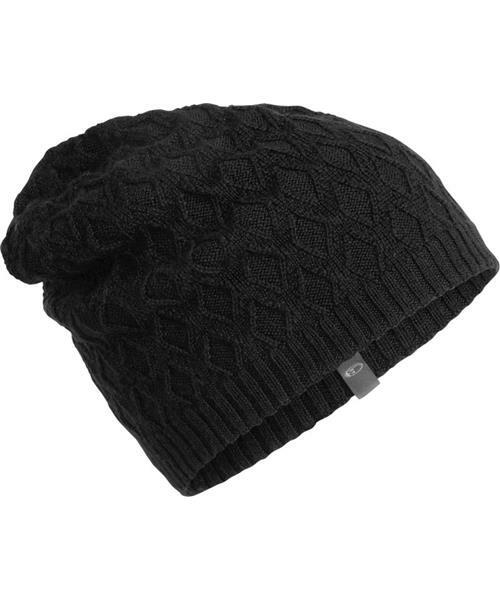 Rated 4 out of 5 by jok1234 from ideal for mild winter weather Soft, comfortable toque! Great for mild winter temperatures. Depth of toque slightly tall so it has extra space at the crown. Rated 5 out of 5 by Heli52 from Comfortable for everyday wear. It’s the perfect size with the perfect amount of stretch and not in the least bit itchy. Rated 5 out of 5 by Jamaislelundi from Great everyday hat Great quality, great colour, great comfort. Highly recommend. Rated 4 out of 5 by Pickyshopper from Great looking icebreaker beanie. Great looks, Color is rich, pattern is subtle yet distinct.